Last weekend P and I went to TAM, otherwise known as The Amazing Meeting. Held every year at Southpoint Casino in Las Vegas, TAM is one of the largest conferences on science and skepticism. Organised by the James Randi Educational Foundation, it boasted a packed four day schedule of talks and panels by the leading lights in the skepticism movement. I'll write a separate blog at some point covering the conference matter; this is a quick update otherwise unnecessary to inform and delight my diligent readership of some additional, unforeseen adventures! We left Las Vegas on Sunday afternoon after our final farewells and headed for the coast. Unsurprisingly, there were several traffic snarls along the way, and the sun was setting as we pulled in at Barstow for a quick break. Setting out again, the engine was making a peculiar noise. I reckoned it was a faulty bearing somewhere on the serpentine belt, but as the belt looked fine and was still running, we set out once more at a slightly conservative pace. 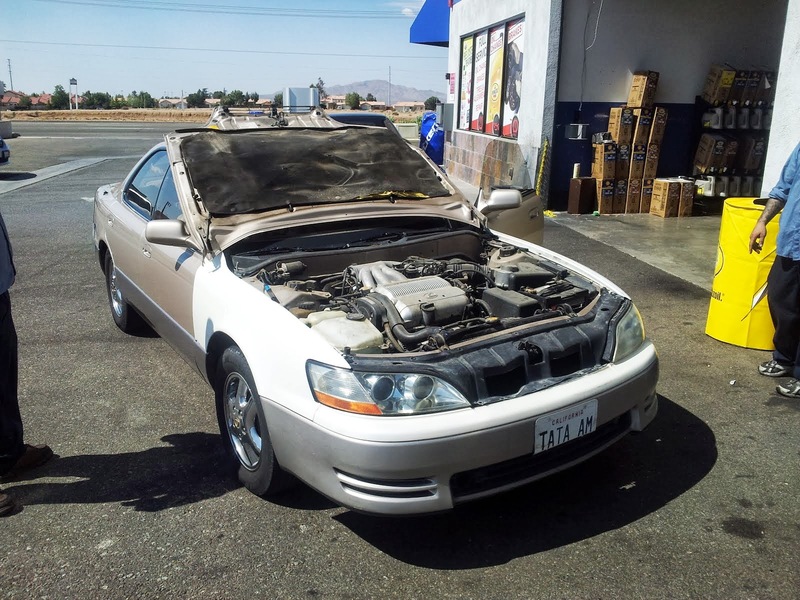 The engine tone was normal, the oil temperature normal, and no warning lights were visible. The only other thing wrong was that the AC had stopped working. 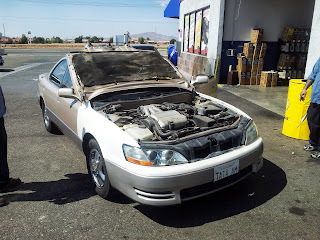 Driving through Hesperia, just before the Cajon pass, the belt abruptly snapped, followed shortly thereafter by a bang as the coolant overflow tank cap made a break for it. We pulled in at the next off ramp, and as coolant dripped, tried to figure out what to do. It was about 9pm on Sunday night, and the number of mechanic shops open was zero. Oddly enough, that simplified the problem. None of the other TAMites were anywhere near, and we were not prepared to abandon the car in any case! I searched on my phone for a local hotel, picked the nicest looking one, and asked if they had any last-minute deals. Turns out they did, so we parked the car in a lot, took a taxi to the Courtyard Marriot (rather nice, incidentally), and after hitting a nearby Denny's for dinner, had an early night. The next morning we were up bright and early. One shop opened at 7am, and by 8am we we'd been towed there by the shiniest tow-truck I'd ever seen. Once on the floor, the mechanics confirmed our fears - the AC compressor had seized. Not being able to be bypassed, it had to be replaced, which is a non-trivial operation. It looked like neither of us would make it to work that day. On the other hand, some TAM decompression would not go astray, so after making sure everything was under control and retrieving our supply of biscuits, we made for a nearby mall and rented a sleek black prius. I've always wondered what was in the San Bernardino mountains. I've never been able to justify a lengthy detour going anywhere in the area, and although I once climbed San Gorgonio, the whole area of Big Bear Lake and so on seemed rather mysterious. We headed for the hills. After about an hour of windy roads and locals going insane speeds, we popped out into the valley. We drove around the lake looking for a nice patch of grassy shade in which to spend the day and catch up on some sleep. In the end, the north shore proved promising and I parked beneath a large pine. With the sail-like side of the prius catching the passing breeze we cranked the seats back and had a pleasant siesta. Around 2pm we drove around to the town of Fawnskin and looked for a cafe from which to obtain breakfast/lunch/dinner. As it happened, I'd parked just across the road from the North Shore Cafe, which according to google was the finest cafe within a hundred miles. If the meals we had there are representative, that claim is probably accurate. In a small area with a large number of knowing clientele, I put away an ahi burger as nice as any I'd had in Hawaii, and P demolished a peculiar sandwich burger hybrid I'd never heard of before. All too soon it was time to head back to town. On the way back, we had a terrific view north from the transverse ranges across the desert toward Barstow. The plains are light in colour; the mountains are dark, dark rock, and the effect was really quite amazing. Again, despite pushing 70 in a 55 zone, locals in large utes whizzed by as if we were standing still, and we descended through a series of hills and rubble mines. Back at the shop, they were 20 minutes from finishing - needing only to recharge the freon lines. As we finished off the auxiliary biscuit supply, one of the funniest things I've ever seen occurred - two elderly women drove into the shop. The hood/bonnet of their car had flipped up over the windshield. It was not apparent how they were able to see, but I think they were sufficiently little old ladies that they could see through the half inch gap between the wipers and the edge of the metal. Soon enough, we were on our way. Ominously, the AC still didn't work very well, but at least the part was new. By 6pm I was back in the office. Home, sweet home.